It's Thursday again. . . already? How do the weeks go by so quickly?! The calendar doesn't lie, so it's time for our weekly visit with the English teacher. Do y'all hate English teachers? When you think of your own English teachers, do you just cringe at the thought? 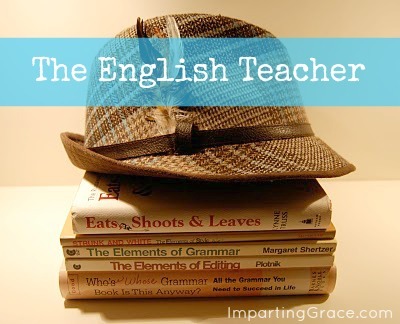 My friend Bonita Lillie recently pointed out that many would-be writers become paralyzed when they hear "the voice of their inner English teachers." Ugh! She's right! That image is one of a teacher who is always prodding students to perfection, rapping their knuckles when they make mistakes. Let's banish that image from our minds, shall we? I wish we could all replace that idea of an English teacher sergeant-major with the notion of an English teacher cookie-baker. Really. I used to bake cookies for my students so that they'd associate yummy treats with learning about grammar. I've said it before, but I'll say it again: good grammar is not the point. Communication is the point. My aim here is to help you master some rules of grammar so that you feel free NOT TO WORRY about them ever again. 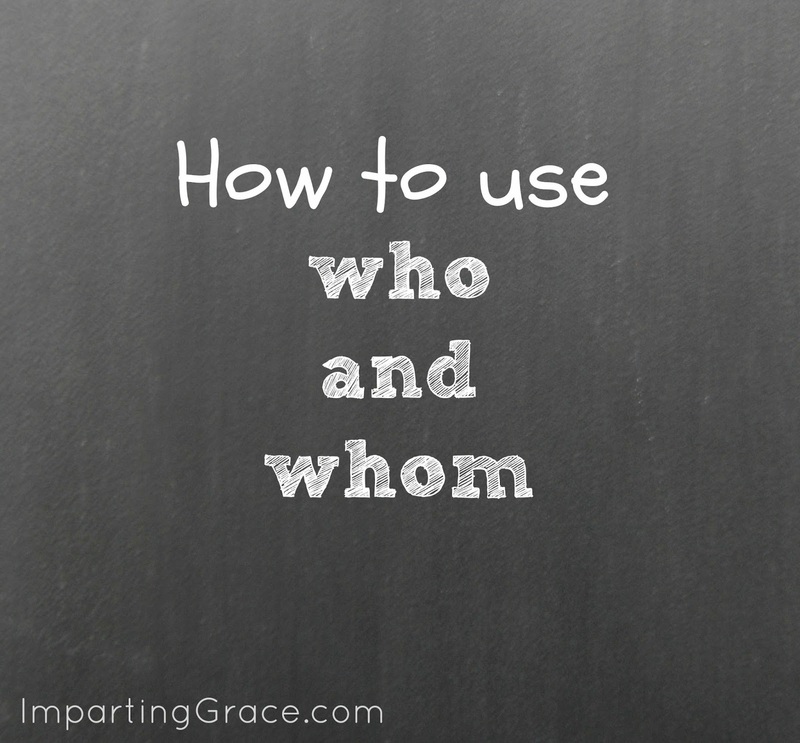 Today I want to answer a question asked by several readers: What are the rules for using who and whom? I'd like for us to take a fresh approach to using these troublesome pronouns. First of all, why are they troublesome? They ought to be pretty easy to understand. They're the very same as he and him or she and her, and we don't usually have any trouble with those pronouns. Who is subjective and should be used when you need the subject of a sentence or phrase and following a linking verb such as is, am, are, was, were, or be. Whom is objective and should be used when you need an object such as a direct object, an indirect object, or the object of a preposition. 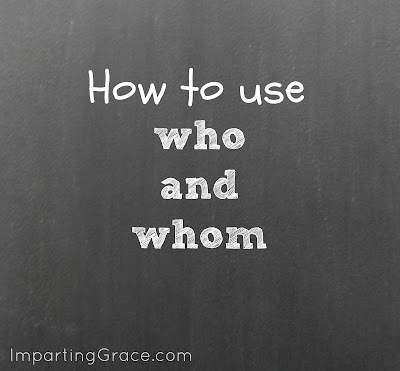 Although those rules are pretty straightforward, we tend to have trouble with who and whom because they are pronouns usually used in forming questions. Questions, also called interrogative sentences, can be troublesome to us simply because the word order is reversed. If you're unsure whether you need who or whom, the best way to figure it out is to mentally change the order of the sentence and decide whether you need a subject or an object. (Who/whom) do you want to invite to the party? You do want to invite __________ to the party. When you turn the sentence around, it's pretty clear that you need the objective form whom to fill in the blank. For instance, you'd use "her" in this spot, not "she." (Who/whom) was your choice in the election? Your choice in the election was __________. In this sentence, you need the subjective form who to follow the linking verb was. (Who/whom) is going to clean up this mess? This time, there's no way to reverse the word order of the sentence, because who or whom actually serves as the subject. So that's easy: you need the subjective form who to be the subject of the sentence. So those are the rules for using who and whom. But I'd like to challenge you on this point of grammar. If you're the kind of person who delights in having everything just right, then go right ahead and use who and whom just as they're meant to be used. For most of us, though, this point doesn't matter too much in our communication. For instance, if I say "Who do you want to invite to the party?" I think you'll understand what I mean even though I've chosen the wrong form of the pronoun. So let's relax. I suggest that, unless we're in a situation that calls for very close attention to detail, let's not worry about this. Let's remember that who is subjective and whom is objective so that we CAN use them correctly when we need to. . . but let's also remember that casual conversation and writing don't often require this much precision. Here's my mantra (I made my students memorize this! ): Language is a gift from God, given only to humans, for the purpose of communication. Did you get that? The purpose is communication. And I think we can communicate clearly and effectively even if just use who instead of remembering to use whom sometimes. So what do you think about this? I'd love to hear your thoughts! Who and whom have always been tough for me. Grammar in general has usually been tough for me, because the schools I went to never focused much on teaching grammar. It was always read, read, read, answer questions about reading, and more reading. My high school honors English teacher really got to me with grammar because I had such a bad concept of it. Richella, this is so helpful! I tend to get mixed up on this. The other thing I get mixed up on is "chose" and "choose". Sounds silly as my blog is titled "Heart Choices". I'm often incorporating the word choose and choice in my blog posts. I like having a nice English teacher like you. Now where are the cookies? LOL. I've had English teachers I loved, and one or two I've hated. I'm pretty sure you would have fallen into the "love" category. ;) In some ways, I think love a teacher grows out of love for the subject. I've always loved English and I've loved my teachers who have taught it well. Richella, you definitely don't fall in the "ugh" category of English teachers. I love the idea of baking cookies so the students would associate the good taste with grammar. Does that mean I should eat cookies every time I write? I'm sure it would improve my grammar, though maybe not my waistline. I'm enjoying these classes, Miss Teacher! Oh my goodness I think I'm in trouble Richella. I need to read every single one of your posts on this subject. Thanks for sharing. My first serious English class was by correspondence, so I HAD no teacher and felt quite adrift. Every English teacher after that was wonderful, and I loved every one of them. They succeeded in turning me into a grammar nerd. I'm enjoying every one of these posts without the slightest bit of fear. Thank you! Richella---this is a wonderful thing to blog about! Hooray for you for helping to improve us. I sometimes get so frustrated with bloggers who choose to "dumb down" in order to get readers. I appreciate you for reminding us that it's okay to communicate intelligently. THANK YOU! Oh, I have always struggled with who and whom, but this is actually making sense to me. So, in a blog post I want to say "thank you to whomever is referring to my blog from Facebook" because I want to thank *her* ,not she. Is that right?? Well, Melissa, you're on the right track! I actually left out this part of the rule, just because I wanted to keep things simple. What you need is the object of the preposition "to"; that's correct. But in this case, the whole phrase is the object, and you need a subject of the phrase. So you'd say "Thank you to whoever is referring. . . " Whoever is the subject of the phrase "whoever is referring to my blog from Facebook," and that whole phrase is the object of the preposition "to." This is another reason "who" and "whom" can get complicated. . . maybe I should go back and add this point to my post. I still maintain, though, that for the most part we should just not worry about "who" and "whom" unless we're needing to be letter perfect. Thank You! I love your lessons. I love what you said about communication being a gift from God! Great point. Thanks for the relaxed approach. I just found your fabulous English lessons. I think they're great. Thank you. I home school and asked my children to read them because you've done such a great job making it painless. I have a question. I answer the phone, when it is for me, this is she. However, I don't really know why. I love that you love grammar! I have a renewed interest in it as I am looking forward to retiring soon and I have a new part-time job as an editor of novels. It has been so-o long since I was in an English class. Would you do a short tutorial on the parts of speech and what they are? Example: A noun is a person, place or thing. A preposition is ...? Blogs are also new to me. Yours is the second one I've been following. I enjoy it immensely.